Despite advances in dental care, millions of people suffer from cavities and gum disease that lead to tooth loss. When your tooth and root are damaged or missing, consider dental implants at Peng Dental Care in Gardena, California: W. Felix Peng, DDS and his team excel in implant dentistry, so call today or schedule a consultation online to learn more about how reconstructive dental care can restore your smile. Dental implants are high-tech titanium anchors that Dr. Peng surgically inserts into your jawbone where the teeth and roots are missing. The titanium fuses with your bone, so the implants are an effective and permanent solution. Custom-made ceramic crowns fit over the anchors and look, feel, and function like your natural teeth. Dental implants also preserve your facial bone structure, which can deteriorate when teeth are missing. How do you insert dental implants? While some dentists may need to outsource portions of the implant process to a maxillofacial surgeon or prosthodontist, Peng Dental Care is a one-stop office for all of your dental restoration needs. 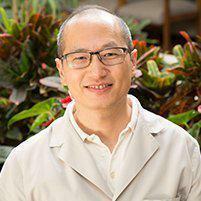 Dr. Peng performs the comprehensive dental implant process in stages. You can expect to have X-rays and impressions of your mouth to ensure your jawbone can accommodate titanium posts. While you're comfortably sedated, Dr. Peng makes a small hole in your jawbone; then he carefully fits the titanium implants. He affixes a small device called an abutment to the implant to hold your new crown securely in place. Dr. Peng then evaluates your bite and polishes your new crown, which looks and works exactly like your natural teeth. The whole process usually requires two to three visits over several months. Am I a candidate for dental implants if I am older? Before proceeding with dental implants, Dr. Peng thoroughly evaluates your mouth, jawbone, and teeth, and explores your full dental history. Some older men and women mistakenly think their age prevents them from getting dental implants. More than age, health is the primary determinant regarding whether you're a good candidate for implants and other restorative dental work. Don’t suffer unnecessarily with loose dentures that make it difficult to talk and eat. Call Peng Dental Care today to learn how dental implants can improve your overall health and quality of life.